Olympus has introduced its new IPLEX NX videoscope, that delivers new levels of excellence in image quality, maneuverability and user-friendliness which help locate flaws that were previously undetectable and streamline inspections in even the most difficult-to-reach areas. True-to-life images are crucial to visual inspection, and the IPLEX NX combines technologies and advanced features for a brilliant image and excellent resolution. An 8.4-in. touch screen displays vivid images and while bright laser diode illumination lights up vast cavities for streamlined inspection. When inspecting potential flaws up close and PulsarPic image processing intelligently adjusts illumination to reduce glare and whiteouts, displaying small details and faults with excellent intelligibility and color reproduction. This new system’s noise-reduction algorithm is designed to decrease artifact colors and noise. With optimized optics, CCD technology, and illumination, the IPLEX NX delivers accurate images for efficient inspections. The IPLEX NX combines an industry-leading high-pixel CCD chip, an ultra-bright laser diode light sys, and Olympus’ PulsarPic processor to reduce signal noise and deliver clear, bright images. With the new IPLEX NX, operators can identify and measure flaws from 2X further away than is possible with conventional videoscopes. The IPLEX NX easily adapts to the inspector’s work environment, whether it be applications involving the inspection of pipes, pumps, turbines, vessels, or tanks. Quickly set up the IPLEX NX as a workstation or take benefit of its portability. Separate the monitor from the base along with a 2 m-long cable for convenient placement. The inspector can also hold the monitor like a tablet or control the inspection with a lightweight remote controller. 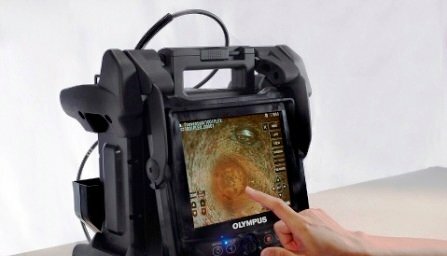 Videoscopes are a reliable, sturdy, and efficient way to inspect internal features, and OLYMPUS’ IPLEX NX is a great choice for those seeking good visual quality, flexibility, and at-hand connectivity.